Listen to Link Ray's "Rumble"
A very wise man once noted that there are many electric guitarists who go to great lengths to make their instruments sound like anything but what they are; airplanes taking off, underwater short wave radios, horns of every shape, size and kind, drums of the same ilk, even, God forbid, synthesizers. 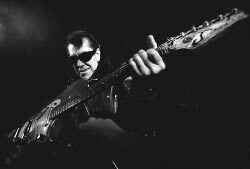 But, he added, for those who long to hear an electric guitar sounding gloriously like just what it is, there is no better place to go than to the great Link Wray. With all due respect to Bo Diddley, Chuck Berry and a thousand others, Link might just be the baddest of them all. Hailing from Durham, North Carolina, where he was born in 1929, the future king of the Danelectro Longhorn and the Supro Dual-Tone was picking his acoustic on the front porch one day in 1937 when an old black bottleneck player named Hambone stopped to give him some pointers. In the late 1940s, Link formed a hillbilly combo, the Palomino Ranch Hands, with his brothers Vernon and Doug. The Korean war interrupted his musical career, and it was during his military stint that he contracted TB, necessitating the removal of one of his lungs shortly following his discharge. After returning to the stage, he concentrated on the guitar, as singing was a bit more difficult now. After gigging with Gene Vincent in Virginia, the Wrays moved to Washington, D.C., in 1955 and became entranced with the emerging big beat. Link composed his biggest hit, "Rumble" on the spot (he claims that "Jesus God" zapped it to him; hardly an unlikely possibility considering the song's unearthly sound) during a 1958 gig in Fredericksburg, Maryland, when promoter Milt Grant asked the band to play a "Stroll" style number to introduce the Diamonds. The audience demanded two encores of the song that night and Link soon cut it for Cadence Records, whose owner, Archie Bleyer, hated it with a burning passion. Unable to get the distorted sound that he wanted, Link punched holes in his amp speakers with a pencil. Although the song sold four million copies and an LP's worth of material was cut, Link and his Wraymen, as they were now calling themselves, were promptly dropped from the label because Bleyer felt their music was a bad influence on teenagers. One could hardly argue with him. Link and the Wraymen attacked their instruments with a savagery that was heretofore unprecedented, mangling the strings and fret boards of their instruments almost beyond recognition on wax and in person at rough 'n' tumble D.C. clubs like Benny's Rebel Room, the Rocket Room and the notorious 1023 Club. Whether the rough surroundings and rowdy crowds had anything to do with it or not, Link's music was laced with an undeniable, underlying mood of menace. Raunchy instrumentals like "Ace Of Spades," "Rawhide," "Comanche," "Jack The Ripper" and "Big City After Dark" certainly sounded like the soundtracks to gang fights and late night playground showdowns, whether they were intended to or not. Then there were the occasional vocal numbers, like Jimmy Reed's "Ain't That Lovin' You Baby," Ray Charles' "Mary Ann" and Willie Dixon's "Hidden Charms." Link hollered them in a voice so insanely deranged that it can only be described as the vocal equivalent of his guitar style. And, lest we forget, Link played sideman to his buddy Bunker Hill on Bunker's insane "The Girl Can't Dance." Brilliant minds do think alike. Nowadays, he's known as the godfather of surf, garage, glam rock, punk, heavy metal and grunge, but Link doesn't need any of these accolades, for he's always been the sickest guitar player—and vocalist—in all of rock 'n' roll. Amen!